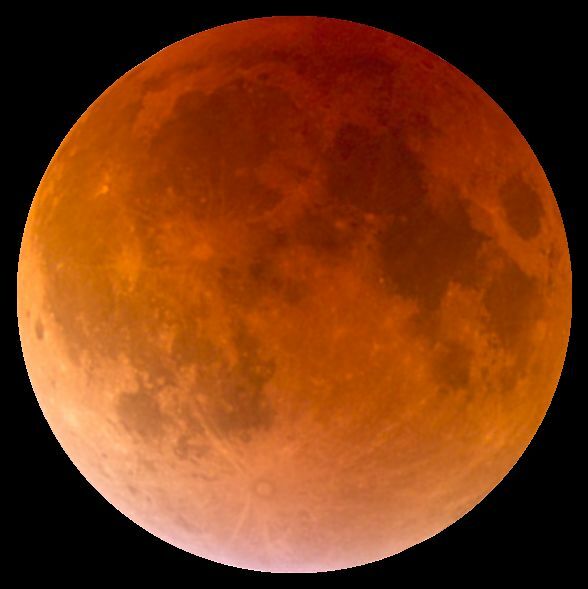 Skywatchers have a double treat in store on 27 July: the longest total lunar eclipse of the 21st century and Mars at its brightest for many years. 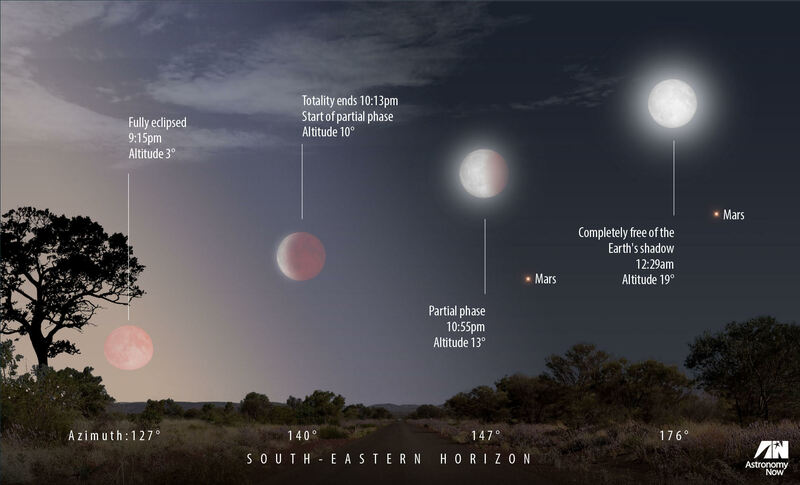 The red planet and the (temporarily) red Moon will appear together in the same part of the sky after sunset. Mars, the Earth, and the Sun will be roughly lined up on 27 July. Mars is on the opposite side of the Earth to the Sun, and hence the alignment is known as opposition. This coincides with the time when the planet is near its closest point to the Earth, and that night it will be about 57.7 million kilometres away. This means that Mars also appears near its largest apparent size in a telescope and is close to its maximum apparent brightness. Mars has a pronounced elliptical orbit, which means its distance from the Sun varies significantly. The distance between the red planet and the Earth at opposition also changes: from less than 56 million kilometres (most recently in 2003) to around 101 million kilometres (Mars was this far away at opposition in 2012). On 27 July the red planet will rise in the south-eastern sky at 21:34 BST in London, and 22:20 in Glasgow. In the weeks after opposition the view is almost as good, so if bad weather spoils the view there is still plenty of time to see Mars at its best. The planet actually reaches its closest point to the Earth on 30 July, when it will be 57.6 million kilometres away. The same night sees a rare astronomical coincidence, with a simultaneous total eclipse of the Moon, the bulk of which is visible from the UK. In a lunar eclipse, the Earth, Sun, and Moon are almost exactly in line and the Moon is on the opposite side of the Earth from the Sun. The Moon is full, moves into the shadow of the Earth and dims dramatically but usually remains visible, lit by sunlight that passes through the Earth’s atmosphere. Stronger atmospheric scattering of blue light means that the light that reaches the lunar surface is predominantly red in colour, so observers on Earth see a Moon that may be brick-coloured, rusty, blood red, or sometimes dark grey, depending on terrestrial conditions. The Moon travels to a similar position every month at Full Moon, but the tilt of the lunar orbit means that it normally passes above or below the terrestrial shadow and no eclipse takes place. In the coming eclipse, people in the UK will see the Moon rise in the south-eastern sky already completely immersed in the darkest part of the Earth’s shadow, the umbra. Moonrise is at 20:49 BST in London, and 21:26 in Glasgow. The Moon should by those times have an obvious red colour, and become easier to spot as the sky darkens. Mid-eclipse is at 21:21 BST, and the total phase ends at 22:13. The Moon leaves the umbra completely at 23:19 BST, and the eclipse ends when it exits the penumbra at 00:30 the following morning. Mars and the Moon will both be in front of the stars of the constellation of Capricornus, and as the eclipse ends will still appear low in the sky from everywhere in the UK. To see them, find a location with an unobstructed south-eastern horizon. Mars may be the easier of the two to pick out, as it will be significantly brighter than the lunar disc during the eclipse. Unlike a solar eclipse, both the eclipsed Moon and Mars are completely safe to look at with the naked eye, so this rare astronomical event can be enjoyed as a free spectacle. The Royal Observatory Greenwich will be streaming a live feed of the event.